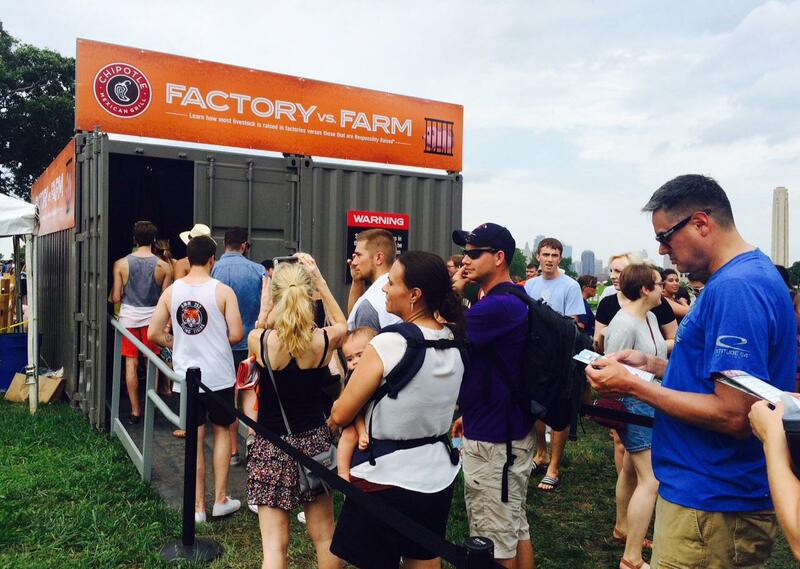 Waiting in line for an exhibit at the Chipotle Cultivate Festival on factory farming. Festivalgoers had to visit four such exhibits to get a free burrito. Pop indie group Small Pools played at the Chipotle Cultivate Festival, held in Kansas City on July 18. 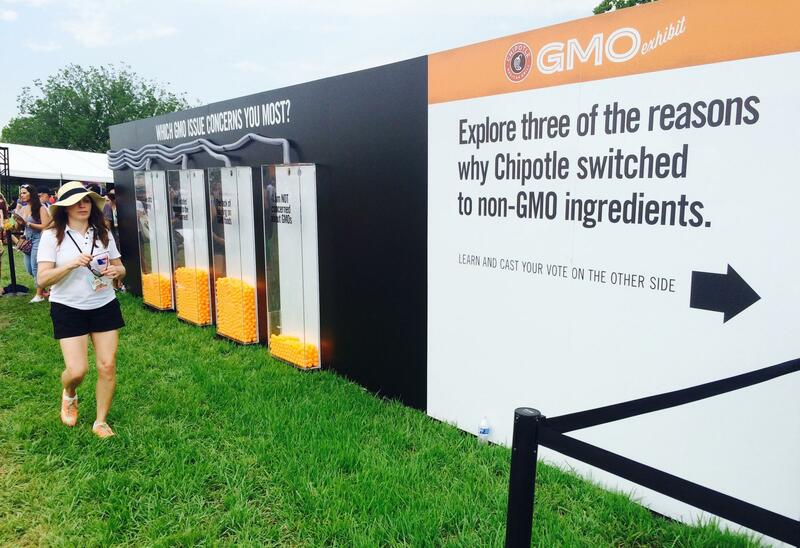 People who attended the Chipotle Cultivate Festival in Kansas City, Mo., on July 18 could vote on their opinions about genetically modified organisms after going through an exhibit. Chipotle, the chain whose slogan is "food with integrity," was the first national restaurant chain to eliminate genetically modified ingredients from most of its menu. Now, the company is going a step further: using its anti-GMO stance as a marketing opportunity. Alex Jessee, a young mother, went through the "GMO Experience," one of the four exhibits. She says she learned from it "that these GMOs could be harmful to us, the environment, but they don't necessarily have to tell us that we're eating them. Which isn't very cool." That perspective dovetails nicely with Chipotle's marketing plan. And it's the side more consumers are choosing, too: Surveys show the majority of consumers — as much as 93 percent, according to a New York Times poll — want their food labeled with GMO information. That's even though the world's leading scientists say GMOs are safe. As sales of GMO-free food skyrocket into the billions, savvy companies are noticing. The demand for those foods falls under what the industry calls the "health halo," the perception that a food is healthful. And that brings us to the marketing of such products as GMO-free potato chips. "It's almost like the era of Mad Men where the slick marketers and the big money could convince people that things that weren't good for them were good for them," says Cathy Calfo, executive director of California Certified Organic Farmers. She says all those people who want non-GMO labels already have one. It's called "organic," and if you buy anything with that green USDA stamp, you will be eating GMO-free food. Now, organic companies don't want to criticize other food companies, but they do worry that marketing a product as GMO-free can mislead consumers who may think that food is healthful. And they're watching while the demand for GMO-free foods outpaces organics. "When push comes to shove, the premium you pay for organic foods may be just too much for most families to afford in practice and non-GMO may be a much more affordable sense of wholesomeness that you get," says Lars Perner, a marketing professor at the University of Southern California. And in a case "if you can't beat 'em, join 'em," the California Certified Organic Farmers recently created another label. It reads "Non-GMO & More," which the group hopes will help organics tap into the growing, non-GMO multibillion-dollar business. Editor's note: A version of this story also ran on Harvest Public Media's site. On Wednesday, at 12:34 p.m., the headline and the story were amended to more closely parallel the version that aired on Morning Edition. Let's listen to the voice of the actress Gwyneth Paltrow here in Washington a few weeks ago. GWYNETH PALTROW: I'm here as a mother, an American mother, who honestly believes that I have the right to know what's in the food that I feed my family. GREENE: The right to know what's in my food. This has become the rallying cry for a movement - a movement to require labeling saying a food contains genetically modified ingredients. But sometimes a movement involving big names and big events can hide the nuance of a story. Here's Peggy Lowe from member station KCUR. PEGGY LOWE, BYLINE: There's an indie pop band playing, long lines at the beer booth. On a hot Saturday in Kansas City, there's a cool mix of marketing and mission statement. 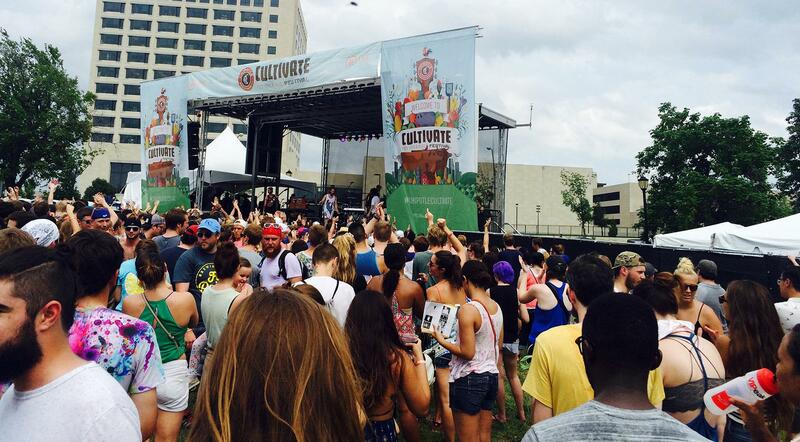 It's branded as the Chipotle Cultivate Festival. UNIDENTIFIED MAN: Big thank you to my main man, Marshall, for bringing us out here and Chipotle for putting on these dope things. LOWE: Among other moves towards what it calls food with integrity, the popular food chain is now cooking solely with ingredients free from genetic engineering. Alex Jessee, a young mother, went through an exhibit on GMOs, and here's what she learned. ALEX JESSEE: These GMOs could be harmful to us, the environment, but they don't necessarily have to tell us that we're eating them, which isn't very cool. LOWE: OK, that's one side of the argument that dovetails nicely with the marketing plan. And most consumers agree that they want to know if GMO ingredients are in their food. Yet a recent survey by The Hartman Group, which does research for food companies, shows about half of consumers don't even know what GMOs are. UNIDENTIFIED NARRATOR: GMO seeds are just one of the many ways Monsanto is helping farmers sustainably grow enough for a growing world. LOWE: That's a promotional video from Monsanto, the world's largest seed company. GMOs are plants whose cells have been altered with different DNA so they have better traits, like a resistance to insects. So farmers who plant these crops can get far better yields. Lars Perner is a marketing professor at the University of Southern California. LARS PERNER: I think that part of the problem is that genetically modified is something that sounds rather scary. LOWE: So here are a couple things to know about GMOs. First, the world's leading scientists say they are safe to eat. That said, there are concerns about possible carcinogens coming from the pesticides used on those crops. Second, non-GMO food may not be as wholesome as you think. It can also be made with plants that were doused with pesticides. It doesn't mean that it's organic. UNIDENTIFIED WOMAN: General Mills is jumping on the GMO-free bandwagon, now offering its original Cheerios cereal without genetically modified organisms. LOWE: As sales of GMO food are skyrocketing, savvy companies are noticing. The demand for those foods falls under what the industry calls the health halo - the perception that a food is healthy. And that brings us to the marketing of such products as GMO-free potato chips. CATHY CALFO: It's almost like the era of sort of "Mad Men," where the slick marketers and the big money can convince people that things that weren't good for them were good for them. LOWE: That's Cathy Calfo, executive director of California Certified Organic Farmers. She says all those people who want non-GMO labels already have one. It's called organic. And if you buy anything with that green USDA stamp, you will be eating GMO-free food. Now, organic companies don't want to criticize other food companies, but they do worry that marketing a product as GMO-free can mislead consumers who may think that food is healthy. And they're watching while the demand for GMO-free foods outpaces organics. PERNER: When push comes to shove, the premium that you pay for organic foods may be just too much for most families to afford in practice and that non-GMO may be a much more affordable sense of wholesomeness that you get. LOWE: And in a case of if you can't beat them, join them, the California Certified Organic Farmers recently created another label. It reads non-GMO and more, which the group hopes will help organics tap into the growing, non-GMO multibillion-dollar business. For NPR News, I'm Peggy Lowe. GREENE: Peggy's story comes to us from Harvest Public Media, a public radio reporting project focusing on agriculture and food production issues. Transcript provided by NPR, Copyright NPR.